To make this nut-free you can use 2/3 cup light coconut milk in place of the full-fat coconut milk and almond milk. If you have leftover fondue you can save it in the fridge and reheat it later for another fondue experience! Place the chocolate and liquids (besides vanilla) in a bowl. Microwave on 50% power for 2-3 minutes, stirring every 30 seconds, until smooth and melted. Adjust consistency with more liquid if needed. Add vanilla and stir to incorporate. Enjoy! In saucepan, combine the chocolate, coconut milk, almond milk and vanilla. Heat on low, stirring often, until the chocolate is completely melted and the mixture is smooth. Keep the heat on low the entire time. If needed, stir in a little more almond or coconut milk for a thinner consistency. Transfer the fondue to a fondue pot or small slow cooker for serving. Serve with treats/dippers of choice. Enjoy! For the microwave method it’s very important to use 50% heat here so you don’t heat the chocolate too quickly. Stirring every 30 seconds will also ensure you get glossy, smooth chocolate fondue. 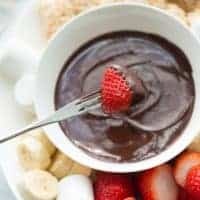 If you fondue seems to thin simply add more chocolate and continue melting. If it seems to thick add a little more liquid to get the desired consistency.